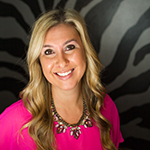 Joey Alissa Berman’s a true success story. From getting her foot in the door at Chicago-based event design and décor company Kehoe Designs almost seven years ago—she worked her way up into a senior event producer role for corporate events. “I love the company and believe in the brand. I’m in it for the long haul,” says Berman, who has a strong background in corporate events, experiential activations, and mitzvahs. 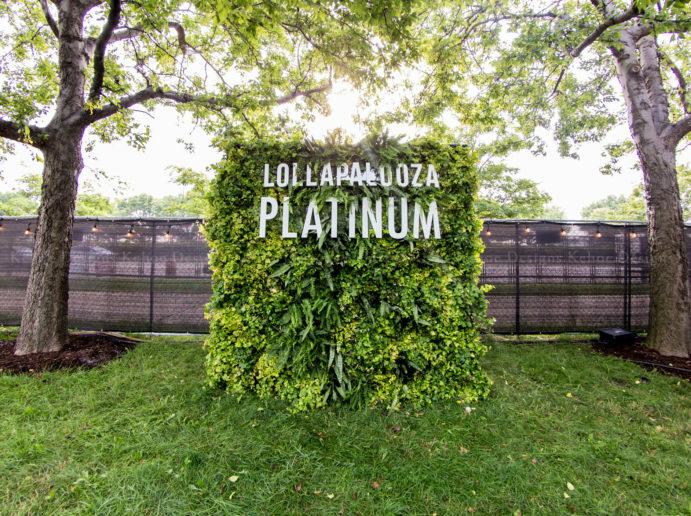 From a modernly minimalistic NFL Draft weekend and her interpretation of the movie ‘Mad Max,’ to the world-famous music festival Lollapalooza, Berman selected three corporate events that best showcase her creative style and vision for her clients. The event was very tech-oriented, with the NFL’s big LED screens and media front & center. Berman used these tech cues, as well as the black-and-gold NFL logo, for the sleek, polished design: curved black leather sofas, glass-topped tables, and stylish chairs. 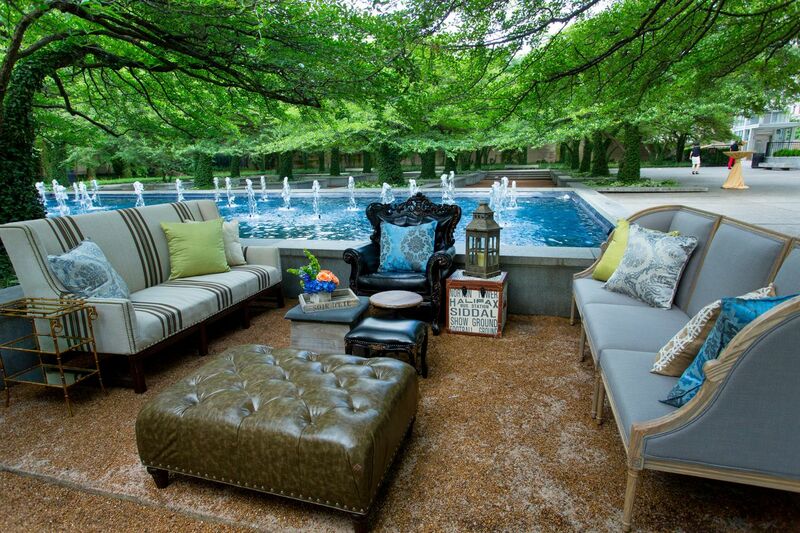 “We incorporated their branding on the boxwood walls, tabletops, and the pillows, and we elevated the design with details like adding a touch of gold to the planters and turf under the outdoor chairs,” Berman says. 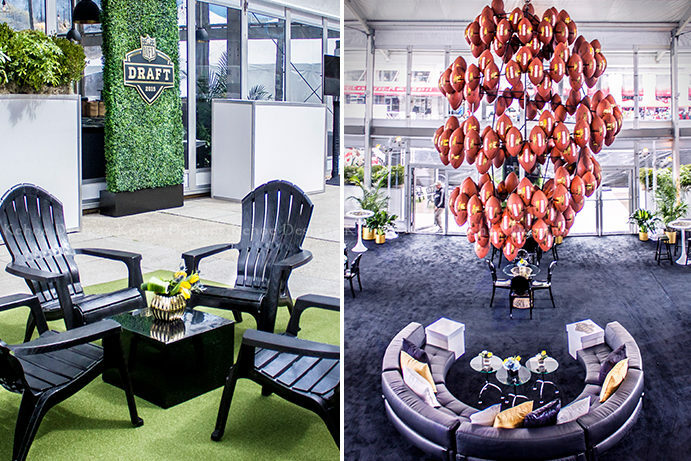 Since the three-day draft featured different sponsors, Berman changed out the branded tabletops and pillows daily. This grand chandelier—made of footballs and in the shape of one—shows off the teamwork at Kehoe Designs, as its structural and welding teams came together to construct it. 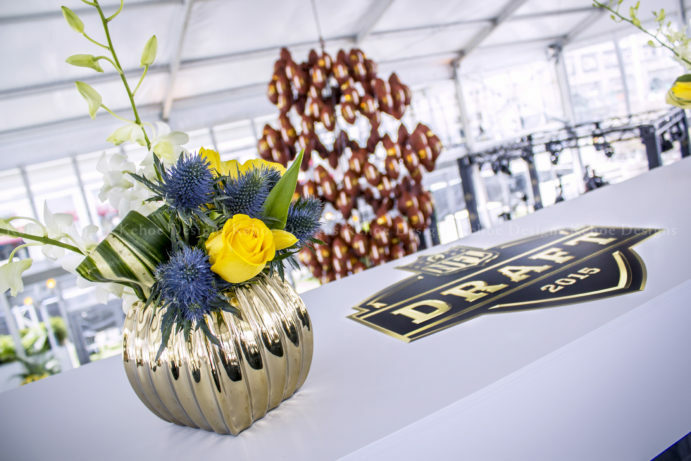 Since the 2015 NFL Draft logo was black and gold, Berman played off the look with black seating and pops of gold, including in the planters. This dystopian-inspired event took a few twists and turns before the big day. “This very out-of-the-box corporate company wanted a ‘Mad Max’ theme. Their goal was to scare the pants off their employees,” she says. 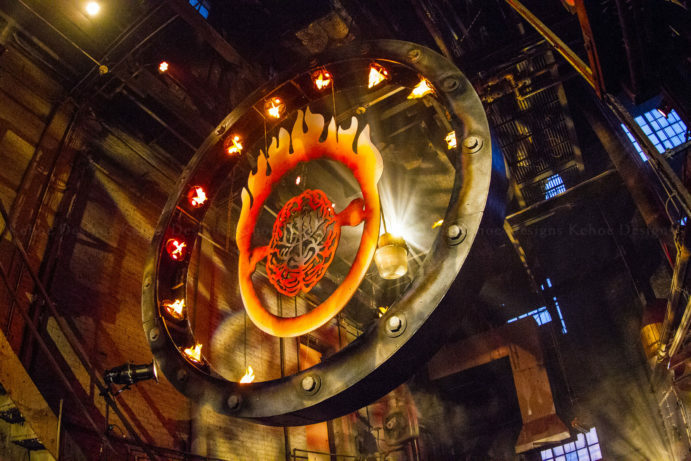 The tech-heavy event included a significant collaboration between all of our Kehoe Designs’ departments—our new tech division, BlackOak Technical Productions, played a significant role. “Our team took ‘Mad Max’ to the next level,” Berman says. Kehoe Designs worked with their partners to source the wildest performers, the most outrageous costumes, and the best hair/makeup artists to bring the “Mad Max” theme to life. “Part of my background is the entertainment arena—a lot of times our clients ask us to help source entertainment, models or costumes, and yes—we can do it!” Berman says. This tent design is electrically vibrant, with the recurring pinks and oranges funneling dynamism into the design. 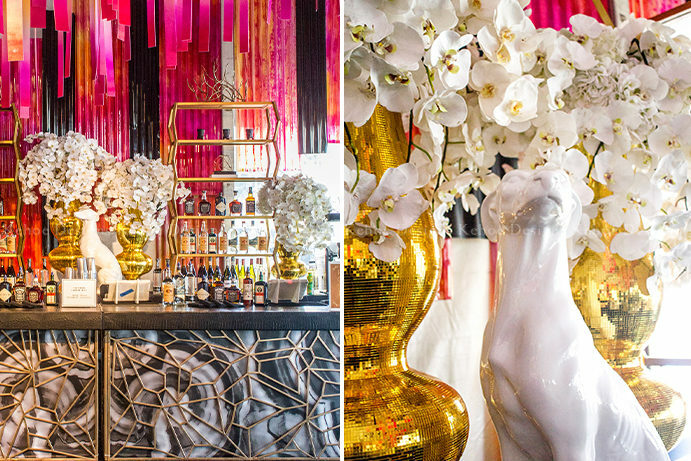 On the tent’s other end, Berman designed an opulent bar, featuring custom-printed gray marble and overlaid with gold faceted panels, and topped by a majestic dog statue and golden vases overflowing with faux orchids. “When you’re doing four-day festivals in a tent, we must consider what plants will be longest-lasting,” says Berman, who thoughtfully added a fringed pink-and-orange ceiling treatment. “That helps with overall atmosphere, giving an alternative vibe vs. the feeling of being inside of a tent,” she notes. 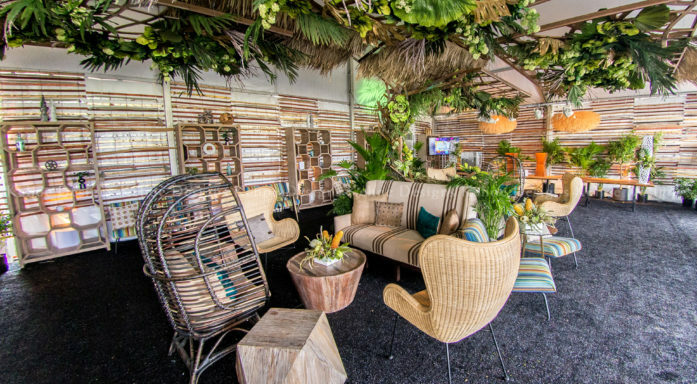 Berman ran with a totally different design for the north tent, creating a calming organic, greenery-infused ‘zen den‘ feel. 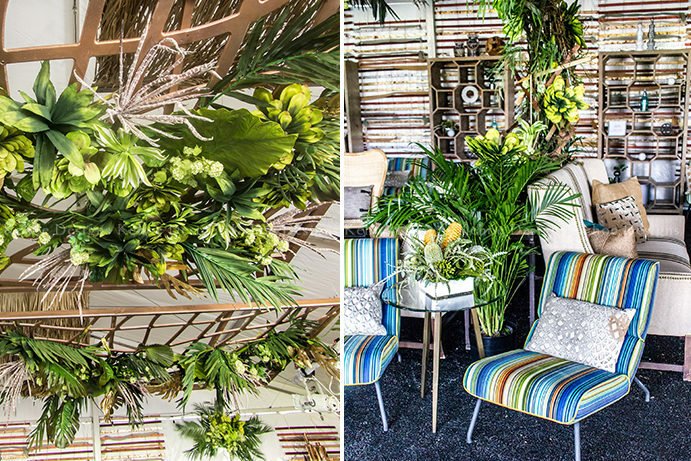 A canopy of copper-painted, wood-slat fencing woven through with greenery and straw-like fronds—all overhanging a collection of wicker-evocative shelving and furniture, covered in neutral fabrics with small pops of blue, teal, and gold. “The ceiling treatment was originally used as a layered wall piece in Kehoe Designs’ lobby—the creative vision to reimagine décor elements is what makes our team so great! 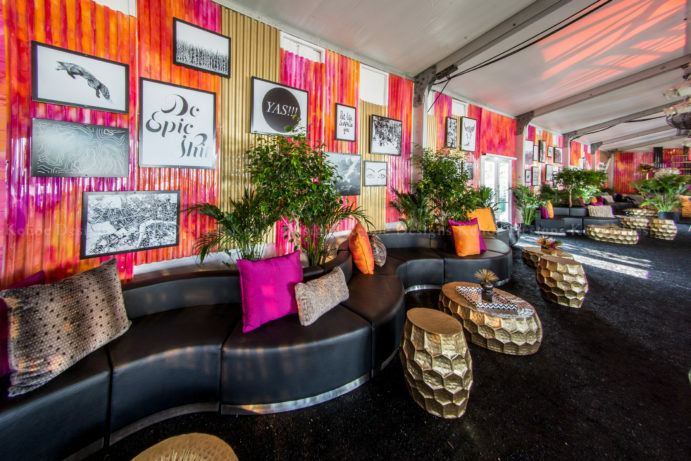 For the tent’s walls, we also painted wooden beach fencing with copper, bronze and gold leaf tones for more of an elevated look,” states Berman. 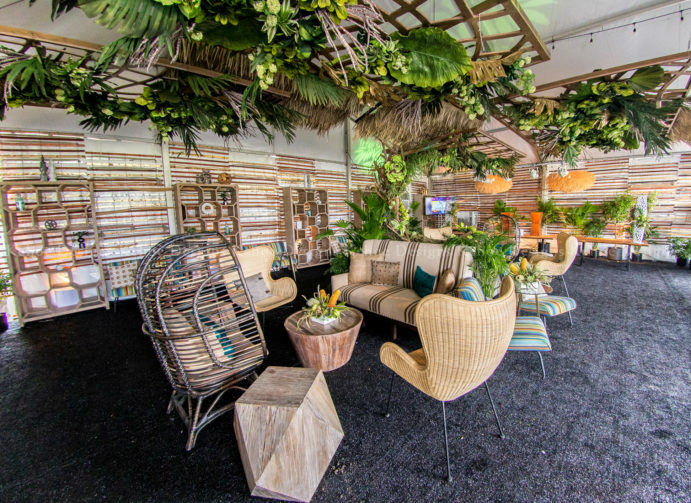 Berman ran with a different design for the second tent, creating a calmly organic, greenery-infused “zen den” feel. What branding elements get you most excited when you’re designing a corporate event? 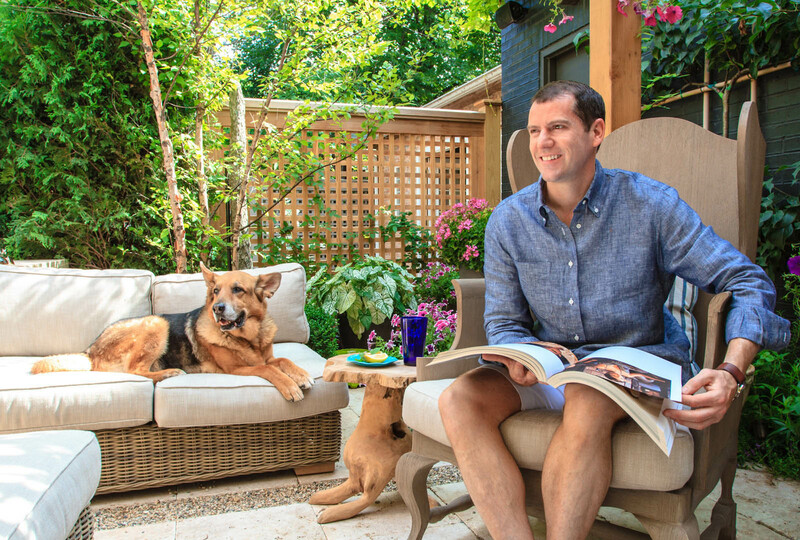 JAB: I enjoy the challenge of integrating clients’ products into our designs. Whether it’s a Christmas tree made of soccer balls or a weeping willow tree made out of green mop heads—the unique product displays help our clients sell their products, and ultimately keep us on the edge of creative genius! Any cool events in your pipeline that you can share with us? JAB: One of my favorite corporate events of the year is coming up in May. This annual event is unique because the client usually asks to feature Pantone’s Color of the Year (for 2019, it’s Living Coral) and integrate their products into the overall décor. 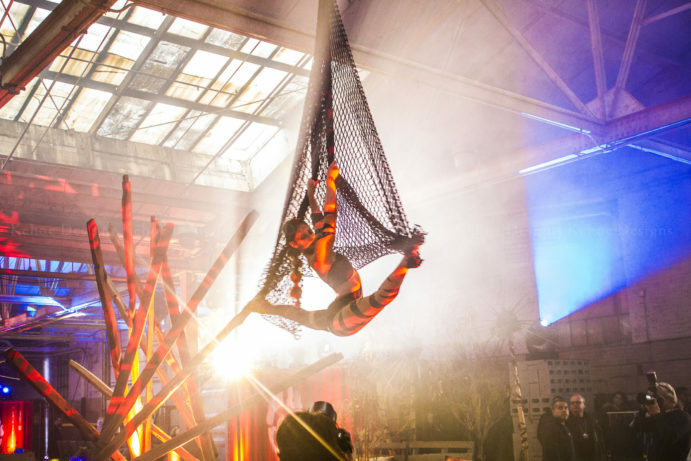 What’s an experiential event trend that you’re incorporating/excited about incorporating into your events? JAB: Social media plays a big role in the majority of our corporate events and activations. Kehoe Designs’ clients are all about creating unique and memorable photo moments. By adding a dimensional graphic to a flat wall or continuing the design onto the floor, we strive to push boundaries and elevate the experience. Click here to see the most recent photo experience with our partners, TagPrints! 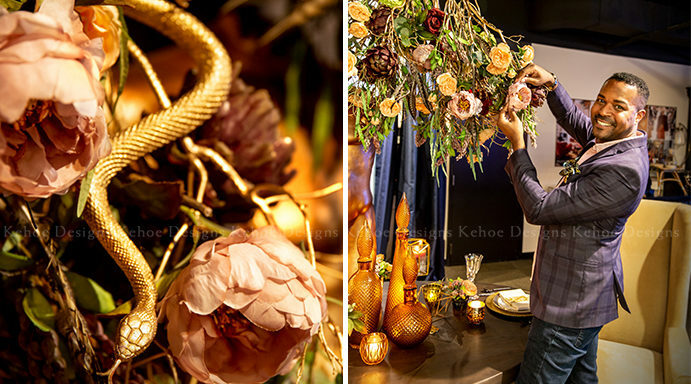 Behind the creative force of Kehoe Designs, there are artisans, craftsmen, and visionaries who create one-of-a-kind, memorable experiences for you and your guests. 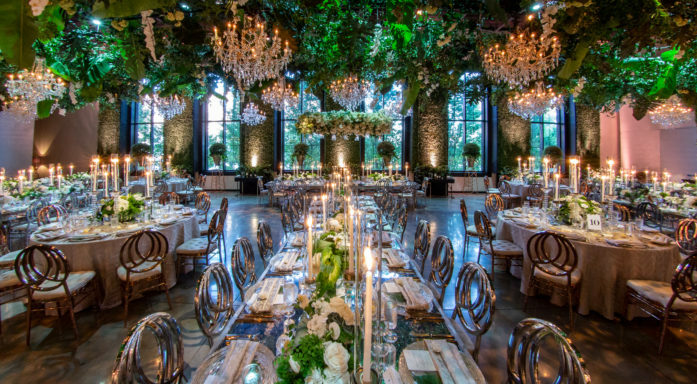 To begin your journey in the passion-filled world of event design & décor, contact us or call us for an appointment at 312.421.0030! © 2019 KEHOE DESIGNS. ALL RIGHTS RESERVED.